Isokinetics means exercise performed with a specialized apparatus that provides variable resistance to a movement, so that no matter how much effort is exerted, the movement takes place at a constant speed. You stand on the 24" x 24" platform and lift one handle at a time. Resistance is provided by a rope wound around a smooth 1 1/4" x 12" chrome pipe. The more rope around the pipe, the greater the resistance. The handles shown are The Hook handles from Sierra Exercise Equipment. 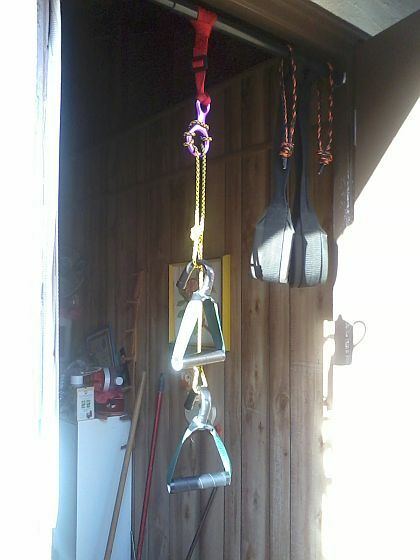 You can easily make handles for this from the Bodyweight Page and scrolling down to "The 15 Min. Door Gym". 1. First things first. The baine of all DIYers is the sticker. The price stickers aren't just stuck on, they are electroplated on. The only way to get them off is with Goof Off. 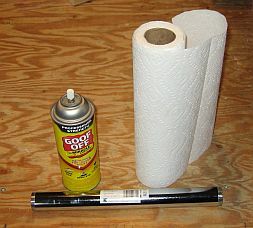 You apply Goof Off directly to the stickers, wrap paper towel tightly around the pipe, over the stickers, and then apply Goof Off to the paper towel. Let it sit for a bout 3 minutes, then remove the paper towel and peel off the stickers. You might need to repeat soaking them again if they don't come off easily enough. After the stickers have been removed, scrub all of the gunk off with Goof Off and a paper towel. 2. 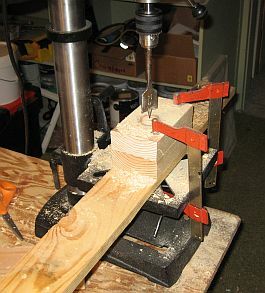 Drill a 1 1/4" hole through two 6" long 2 x 4's, 3 1/2" from the ends and centered between the edges of the 2 x 4's. It is important that the 2 x 4's be exactly the same length and that the drilled holes align. 2a. ADDENDUM: I had originally made this machine without the eye screws, but after using it a couple of times, it became apparent that the eye screws were needed. So, after drilling the 1 1/4" holes, drill guide holes for 1 7/8" eye screws. Drill a guide hole on one of the 2 x 4's 3 1/4" up from the end of the 2x4 that the large hole is nearest to, and 5/8" from the edge of the 2x4. Drill a guide hole in the other 2x4 centered above the large hole and 4" up from the end of the 2x4 that the large hole is nearest to. Plan the locations of the holes so that the eye screws will end up as shown in the picture. One eye screw is lower and in front. 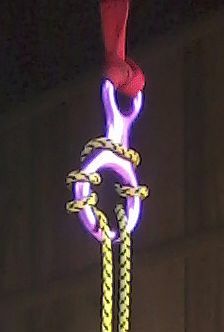 The rope will come up from underneath the pipe and pass through that eye screw. The other eye screw is centered above the pipe. The rope will go through that eye screw and then over the pipe. 3. Slip the ends of the 1 1/4" pipe through the drilled holes. 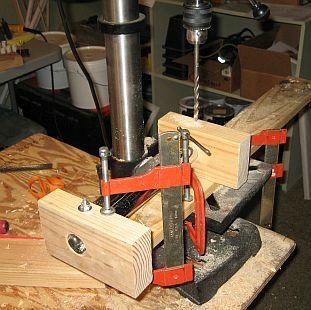 Drill a 1/4" hole through the sides of the 2x4's, through the centers of the pipes within the holes, and clear through the other sides. Push 1/4" x 4" hexhead bolts with washers through the holes, install washers on the ends, and tighten with stop nuts. These bolts hold the pipe in place. 4. 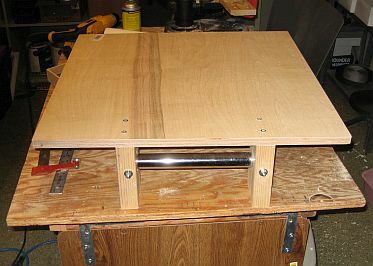 Place a 24" x 24" sheet of 3/4" plywood over the pipe assembly on top of the ends of the 2 x4's that are nearest to the chrome pipe. Support the other end of the plywood so that it is level. 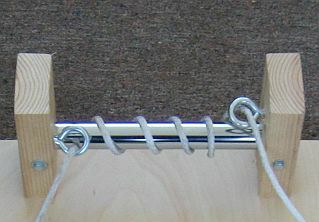 Secure the pipe assembly to the sheet of plywood, centered on one edge, with flathead wood screws through the plywood. 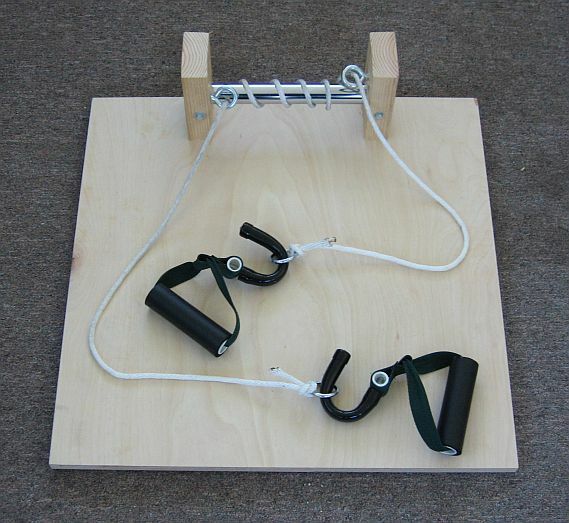 This isokinetic set up works in the same manner as does the machine in the section above - resistance is created by rope being dragged around a smooth surface. The device used is a figure eight mountaineering descender which can be found in websites around the Internet for about $15.00. The handles shown are The Hook handles from Sierra Exercise Equipment. You can easily make handles for this from the Bodyweight Page and scrolling down to "The 15 Min. Door Gym".